Lawmakers are demanding that a California man take down poster-size swastikas displayed in front of his house, calling the signs racist and vulgar. State Sen. Marty Block, chairman of the Legislative Jewish Caucus, said at a news conference Thursday that the symbol desecrates the memory of 6 million Jews who died in concentration camps. At the house, the symbols used by German Nazis in World War II have replaced stars in one American and two Israeli flags. Other lawmakers, veterans and labor leaders joined Block in calling for the signs to be taken down. 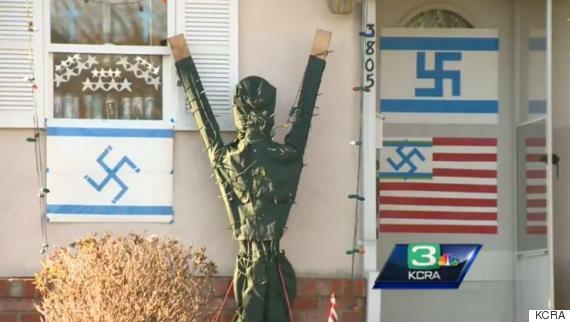 He says the homeowner has the freedom to deface his own home, but that doesn’t make use of the swastikas right.